I have a guilty secret – I actually quite like Richard Dawkins. It’s always good entertainment watching someone who is so eminent in his scientific field, continually putting his credibility on the line by taking on religion despite his limited knowledge of the subject. Through his attempts to dismiss all things religious he has ended up acting more and more along the lines of a High Priest of atheism, creating his own irreligious dogma in order to counter the religious dogmas he despises so much. Through his books, which include The God Delusion, he has gained worldwide fame and now we get to experience a taste of this superstardom in his own docufilm, The Unbelievers. This film which was originally premiered at Hot Docs Film Festival in Toronto in April 2013, is officially released today in the UK on DVD. 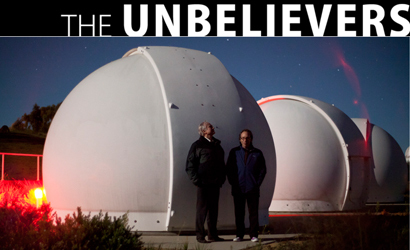 The film follows Dawkins and his close friend, the renowned American physicist Lawrence Krauss as they travel around the globe attending book signings and speaking engagements culminating in the 2013 Rally for Reason on the Capitol Lawn in Washington D.C. which was billed as the largest secularist gathering in history with an attendance of 30,000 people. Anyone who is expecting illuminating discourses from Dawkins and Krauss unpacking their thinking behind their great dislike of all things God-related will be sadly disappointed. Dawkins and Krauss do make for easy viewing, especially Krauss whose charisma nicely offsets Dawkins dry and erudite persona. The whole film though, is little more than a superficial atheist love-in. The director, Gus Holwerda is clearly enamoured by his subjects but appears to have decided that getting to go behind the scenes with the two of them will make more interesting viewing than watching them engage in meaningful debate with those they oppose as they speed from country to country. Instead, the film goes out of its way to build Dawkins and Krauss up as modern-day messiahs who have come to save us all from the shackles of religion, presenting a one-sided proclamation that science has defeated religion without providing any suggestion that they may not be 100 per cent correct on this assumption. In order to reinforce this message a number of well-known celebrities have been brought in to provide a few soundbites during a prologue and over the closing credits . Ricky Gervais, Stephen Hawking, Tim Minchin, Cameron Diaz and other high-profile atheists happily add their thoughts on why science is king and religion is only for extremists and the deluded. The film’s arrogant cockiness might please loyal Dawkinites, but it is its biggest flaw. By presenting science as the great hope for mankind and Dawkins and Krauss as overflowing fountains of rational wisdom, it offers little to persuade those who are not fully signed up to the cause to reconsider their ways. The most obviously unsound assumption is that science and religion cannot coexist. For Dawkins in particular, this is a black-and-white issue, but of course it isn’t. There are enough eminent scientists who quite happily believe in God. This is conveniently ignored as are questions about life that science, by its very nature cannot answer. It only takes one miraculous occurrence to blow Dawkins’ whole ‘science tells us everything we need to know’ approach out of the water. I’ve seen too much with my own eyes to know that you dismiss miracles at your peril. Ricky Gervais is right. Facts should change your beliefs. What this film fails to explain is that this can work both ways. In my case hard facts have reinforced my Christian faith, not destroyed it. Richard Dawkins is very good at finding the worst aspects of some beliefs and holding them up as a reason to discredit religion as a whole, which ironically is both irrational and unscientific. He and Krauss are right to say that religions should be questioned and challenged and sometimes ridiculed. If believers are not willing to question their own beliefs or decide to pick and choose which bits of their religion to believe, then it is perfectly acceptable for those on the outside to be dismissive. If a religion has inherent worth then it should be able to stand up to close scrutiny. Sadly Dawkins and Krauss don’t appear to be willing to apply such a level of scrutiny to religious belief or choose to make any distinctions between different religions. It’s more a case of, ‘This is all nonsense because it doesn’t fit with my scientific approach to life.’ Their brand of atheism, at least as the documentary portrays it, leaves me cold. It relies on an intellectual snobbery that confidently believes it has a monopoly on the truth to put down and belittle those who think differently. If that is the best Dawkins’ atheism has to offer, I’d rather give religion a go first, just in case he might actually, possibly be wrong on this. Apologetics, Film review, Guest Blogs, Political Opinion, What Is Truth?